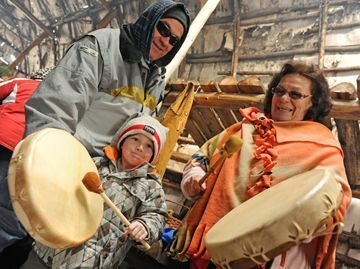 Families will be able to listen to and share stories with Mi’kmaq storyteller Nina Antoine-Ogilvie as well as explore and shop at First Nations Craft Vendors throughout the day! Children can discover the secrets to archaeological digs by uncovering and mapping chocolate chips in our Cookie excavation and explore the importance of First Nations Wampum as a means of communication through our wampum activity. In the morning, Dr. Chris Ellis from Western University will be on hand to identify artifacts, and Dana Poulton, Archaeologist and President of D.R. Poulton and Associates (a key contributor to our Changing Landscapes exhibition in the temporary gallery) will share London’s rich archaeological heritage and his experiences excavating Victoria Park in the afternoon. We are also excited to be hosting a Medicine Wheel Teachings and Art Workshop facilitated by Hugh Hill, Laka’tos, from the Oneida Nation on Family Day. 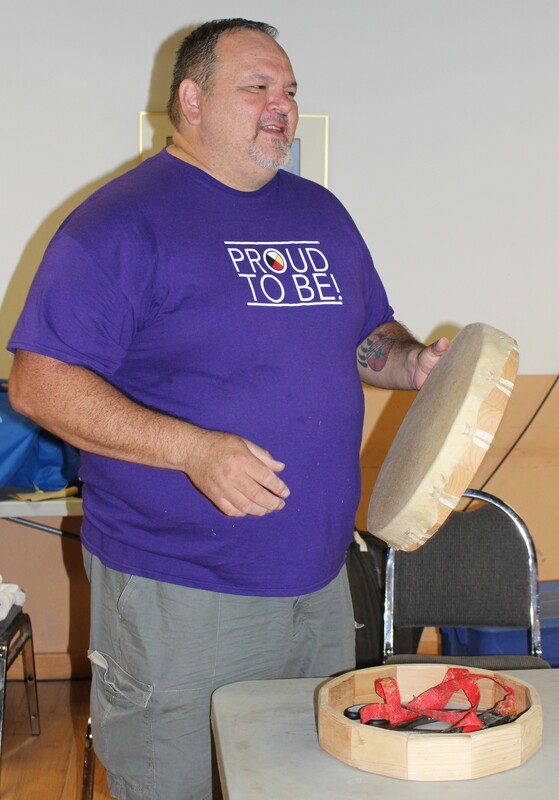 Mr. Hill will share the teachings he has learned from the elders, teachings he continues to learn and pass along. The Medicine Wheel represents all creation, harmony and connections. 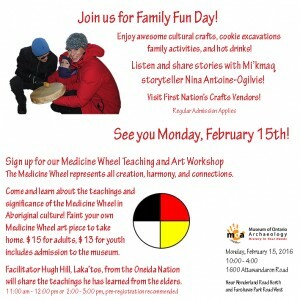 Come and learn about the teachings and significance of the Medicine Wheel in Aboriginal culture in this interactive and family fun workshop. Participants will paint their own Medicine Wheel art piece to take home. 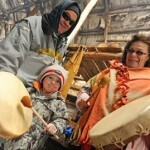 So put on your warm woolies, gather up your family, and join us this Family Day! Cost: $15 for adults and $13 for youth (5-17 years old) and includes admission to the museum. To register for the workshop, or for more information about the event, please contact the museum by phone at 519-473-1360 or email info@archaeologymuseum.ca. pair, but I really would love to learn how to make a pair on my own….I think they would be more special to me. Do you offer any such classes??? And if yes, when, where and how much is the class. Thanks for your question. We do indeed host Moccasin workshops from time to time at the museum and share the information through our newsletter, blog and social media channels (Facebook, Twitter and Instagram). We’re chatting with our facilitator and should have some dates for everyone shortly. However, in the interim, please forward your contact information via email to info at archaeologymuseum dot ca and we’ll ensure your name is on the waiting list for the first available workshop. Have a great day! I would love to join in more classes too! 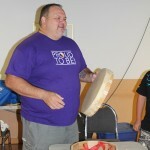 I attended the Medicine Wheel workshop today and really enjoyed it. Hugh was a great teacher and I learned quite a bit more about the medicine wheel then i initially knew plus other tidbits of info! We’re glad you enjoyed the Medicine Wheel workshop today. If you are interested in the Moccasin workshops, please send an email to info at archaeologymuseum dot ca and we’ll let you know as soon as it’s schedule. You can also sign up to receive information about upcoming workshops through our newsletter if you haven’t already done so. Thanks for visiting today.